The Islanders have signed center Ryan O'Marra, their 2005 first round draft pick and a member of the gold medal-winning Team Canada at this year's World Junior Championships, to a three-year contract. The 18-year old O'Marra, the 15th pick overall in last summer's draft, begins his professional career today as a member of the Bridgeport Sound Tigers, the Islanders' AHL affiliate. Said Islanders Head Scout Tony Feltrin: "Ryan has the heart, size and skill to eventually be an excellent player at the NHL level. You cannot question his leadership ability and his work ethic." The 6-1, 200-pound O'Marra was the second-leading scorer for the Erie Otters of the Ontario Hockey League. In 61 games, O'Marra was 27-50-77 with 134 penalty minutes. At the World Junior Championships in December, O'Marra had two assists and 18 penalty minutes in six games for Team Canada. "It's so great to have the contract done early so I can begin playing for Bridgeport," O'Marra said today. "The Islanders have been so good to me since the draft, staying on top of my development in Erie and getting this deal done. I'm anxious to get on the ice with the Sound Tigers and show them what I can do." O'Marra's signing means that the Islanders' last five first round picks are progessing in the organization at the NHL or AHL level: Rick DiPietro (2000), Sean Bergenheim (2002), Robert Nilsson (2003), Petteri Nokelainen (2004) and O'Marra (2005). The first four all played last night for the Islanders. O'Marra will travel with the Sound Tigers for their game tomorrow in Philadelphia and could make his debut sometime in the next week. Bridgeport has home games on Saturday (7:05 against Providence) and Sunday (4:05 vs. Binghamton). - Taken fourth overall by the Erie Otters in the 2003 OHL Priority Selection. - Played for Team Ontario and won a Gold Medal at the 2004 World Under-17 Hockey Challenge held in St. John's. Also was an alternate captain on Team Canada in the August 2004 at the Under-18 Championships and scored five points in five games. - Named the Erie Otters Most Improved Player in 2004 and named the Otters' Most Sportsmanlike Player in 2004 and 2005. 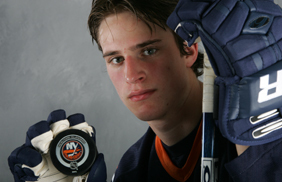 Selected as the Otters' Scholastic Player of the Year in 2005. - Won a gold medal and was an alternate captain for Team Canada at the 2004 Under-18 Junior World Cup. - Played on the Canadian Under-18 national team that finished with a silver medal at the 2005 Under-18 World Championship in Plzen, Czech Republic. Also represented Canada at the 2005 Under-18 World Championships in Ceske Budejovice and Plzen, Czech Republic. - Played for Team Canada and won a gold medal at the 2006 World Junior Championships.